Davis IT Solutions has provided solutions to businesses struggling with IT challenges for over a decade. When you partner with Davis IT Solutions, you are choosing a wide array of talent and experience. We partner with leaders in the IT industry to provide the technological edge that is needed to allow your company to expand and become more efficient in todays business space, from small businesses to Fortune 500. Our services give businesses a way to reduce cost and still have experienced staff that on a moment’s notice can handle all manner of IT issues. Our philosophy is that our clients should be focused on running their core businesses – and not their technology. That’s where we come in. ...and help Your Business Grow. We understand that all businesses have different needs. As a result, we’ve built our support services around our clients needs. Whether you need all or partial outsourcing for your IT needs, we can assess and supplement services based on your needs. You have an in-house IT guy. That's great! Our Monitoring services can supplement your staff with 24/7 system alerts and reporting. Need your network assessed or assistance on a one-time project or migration? We help guide you in the right direction. We Manage Your Business IT Needs and Help Your Business Grow! If you have ever thought “I’ve got better things to worry about than my IT systems”. Davis IT Solutions' comprehensive suite of services is all your business will ever need to take care of your business technology. Our unique brand of On-site, Help Desk, and Cloud solutions allow your IT headaches to be a thing of the past. Why Do Our Clients Choose Davis IT Solutions? We've been at this for a while. More than 20 years actually. This means we know business technology inside and out. In fact, we have a team of highly trained, certified professionals who can rise to any challenge. Chances are, we’ve worked in your industry before, and that means we can hit the ground running – fast. 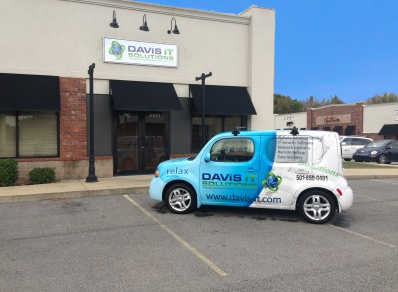 Whether you need supplemental support for your IT staff or the confidence that comes with a turn-key solution, Davis IT Solutions is always ready to help. And if you aren’t sure what level of support you need, we’ll help you choose just the things you need. If we’ve learned anything over the years from our customers, it’s this: technology done right can give businesses a competitive edge. With Davis IT Solutions, you always get the benefit of our breadth of experience and know-how. Through technology, with the right consulting and great support, we will help you grow!